Born and raised in Bismarck, ND, Deidra's love for animals can be traced back to her childhood and times she barely remembers! Her Grandpa Ed had a huge heart for animals, which was passed down to her Mom, and in turn, passed on to her. Her Brother Duran, recently said he feels this rescue is her legacy and anyone who truly knows her would agree. It’s always been about the animals. Dei has lived in NE since 1994 and has been active in varying degrees of rescue, knowing eventually she would start her own. In late 2012, she met a small group of amazing people who shared her passion and vision, and they have since become the backbone of Revolution Rescue. “This team is dedicated to helping animals in need and we are determined to make a positive difference in the animal rescue world. I’m so blessed to have their support,” she said. Spare time is spent with friends, doing what friends do…saving lives, one animal at a time. Tiphany is originally from Stromsburg, NE and came to Lincoln in August of 1995 to attend college at UNL. She liked it here so much, she decided to stay after graduating! 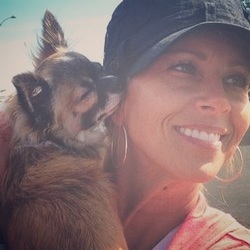 She has always had a passion for animals, although her drive for rescue came after researching puppy mills and seeing the horrific situations helpless animals come from and the pain they endure. In January 2011, Tiphany started volunteering as a dog walker at Lincoln’s own Capital Humane Society, which developed into being a foster for them. In August of that same year, she became a foster for Nebraska No Kill Canine Rescue, then moved on to R.u.F.F. Rescue in May of 2013. There, she served as the Intake and Volunteer Coordinator and was also a member of the Board of Directors. Tiph is also actively involved with Puppy Mill rescue and volunteers with Bailing Out Benji, an organization that helps us acquire our puppy mill rescues. Her other interests include, scrapbooking, shopping (of course), drinking wine, and rooting for the Chicago Bears! She’s also obsessed with the color orange, which many may find strange, but it fits…orange is the official color of Animal Rescue! 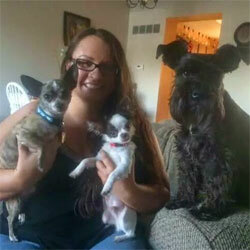 Her furry companions include Maggie, who is a Miniature Schnauzer, two adopted Chihuahuas named Chase and Bentley. She also has 3 rescue cats...to say the least, she has a full house, and wouldn’t have it any other way! Originally from Eden Prairie, Minnesota, Lizz came to Lincoln for school in 2012. She recently graduated from UNL, majoring in Entrepreneurship and Vet Science. inspiration for continued determination in saving the lives of animals. current pets include 3 pit bulls, 1 small dog, 3 cats, 2 ferrets, and a horse!